Karoshi (or “death by overwork”) is real. It is not some exaggerated description of the exhaustion of burnout, but is a documented, very serious condition that has dire consequences for its victims. In my training and consulting practice, I’ve heard many people emphatically state that their work is “killing” them. Fortunately, I have not had a client die at his or her desk as a result of severe work overload — even though many experienced chronic or acute physical disease. 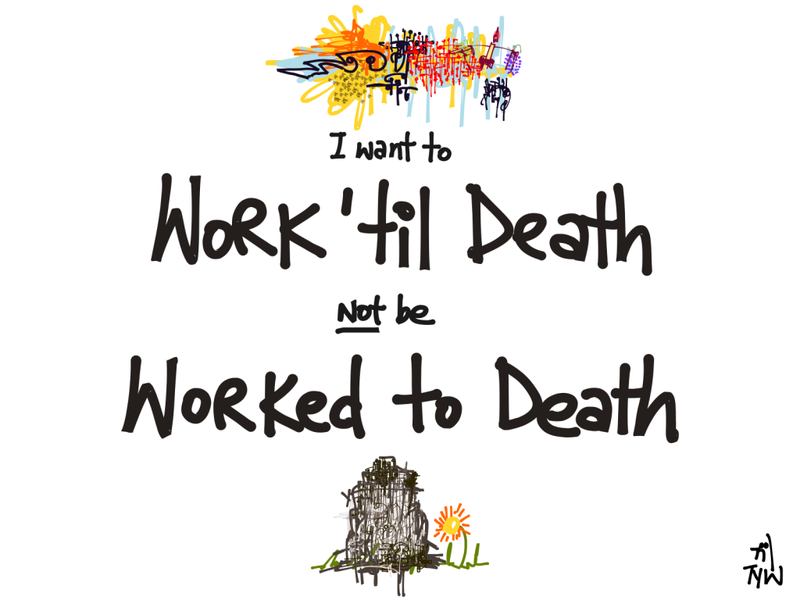 But death by overwork is a very real phenomenon. The term used to describe this condition is “karoshi.” It is the business counterpart of the Japanese form of suicide called hari-kiri. In fact, karoshi has been recognized as a cause of death in Japan since the 1980s. This obsessive attitude toward work has been hailed by some critics as the reason for Japan’s high levels of productivity. Recently in May 2015, the Japanese Prime Minister’s cabinet approved a bill exempting the option of overtime payments to workers who earn more than 10.75 million yen ($88,000 USD) annually. This so-called “no overtime pay bill” focuses more on productivity (rather than work hours) and presumably offers greater flexibility to workers. But the proposed bill has been met with opposition by critics who argue that the number of overwork-related health problems and deaths could potentially increase if the bill is put into law. What Does Karoshi Have to Do With American Workers? Japan’s proposed “no overtime pay bill” is similar to the exempt status of certain workers under the Fair Labor Standards Act – those workers who are paid a salary, meet minimum compensation thresholds, and have duties that fall within the FLSA’s requirements for exemption. Like exempt employees under FLSA, many Japanese workers perform duties and responsibilities of their jobs via “free overtime.” In other words, they are completing important elements of their jobs but not being compensated for the corresponding hours. Some studies suggest that Japanese workers tend to work much longer than those in other countries. While 11.3% of U.S. employees work over 50 hours per week, this is only half of the 22.3% of Japanese who log in these long hours. Although official Japanese figures show that there are an average of 400 overwork-related deaths per year, some researchers suggest that the actual numbers could easily approach 20,000. Read that number again: 20,000 hard working, dedicated, high achieving Japanese employees die from overworking. Are American workers just as susceptible to death by overwork – or is this exclusively a Japanese phenomenon? The refrain in many organizations is “time is money.” To stay ahead, employees attempt to work more hours with less sleep, relying on caffeine to overcome the effects of sleep deprivation. There is mounting evidence that information overload, work overload, impossible deadlines, and limited resources have surpassed our human ability to process all this information – we are simply not hardwired to work such long hours without respite. “Vacationitis” is growing as fewer and fewer workers take the vacation days that are owed to them each year. According to the March 2015 Project: Time Off report, over $224 billion of unused vacation time sits on corporate balance sheets. The result? Employee health, happiness, productivity, and performance decline – which leads to lowered overall organizational performance. Puleo’s Pointers: Are You at Risk for Karoshi? Although my primary area of expertise is workplace burnout, I can’t help but be concerned that a burned out worker can succumb to death by overwork if remedial action is not taken immediately. If chronic distress precipitates burnout, then a full-blown burnout might easily contribute to karoshi. You routinely work more than 60 hours per week. You can’t remember the last time you took a real vacation day that did NOT tether you to the office via an e-leash. You obsessively talk about work – and have trouble discussing or focusing on anything else. You take technology to bed with you. You have trouble sleeping, eating, or communicating. You feel out of control…instead of being the master of your destiny, your work has become an unforgiving master of your time, energy, and resources. Workaholism, burnout, and karoshi are NOT inescapable byproducts of today’s fast-paced work environment. Actively seek the help that is available so that you can reclaim your energy, creativity, and uniqueness. There will never be another you – don’t let burnout or karoshi shorten your life. Isn’t it time for you to enjoy ALL aspects of your life?